In two comprehensive studies, scientists from the Helmholtz Zentrum München (HMGU), Ludwig-Maximilians-Universität München (LMU) and Technische Universität München (TUM) have discovered new associations of two major type 2 diabetes risk genotypes and altered plasma concentrations of metabolic products. The "Virtual Institute Diabetes" (VID) joint research cooperation is thereby making an important contribution towards explaining the genetic and molecular basis of diabetes, a widespread disease. The results have been published in the journals 'PLOS ONE' and 'Metabolomics'. For these investigations, participants of the population-based cohort study KORA* carrying high-risk diabetes gene variants without having a diagnosed diabetes, as well as participants without an increased diabetes risk were recruited. All study participants were subjected to a metabolic load. The nutritients, particularly sugars and fats, were administered either orally or intravenously. The scientists subsequently determined the concentrations of 163 metabolic products in blood samples from the participants. The teams headed by Prof. Dr. Thomas Illig (HMGU) and Dr. Harald Grallert (HMGU), Prof. Dr. Jochen Seißler (LMU), and Prof. Dr. Hans Hauner (TUM) and Dr. Helmut Laumen (TUM) were the first to supply a comprehensive characterisation of the metabolic performance in regard to the respective genotype. It was observed that the concentrations of the recorded substances represent a particular metabolomic response pattern depending on the genotype. It was possible to verify specific metabolic effects, particularly for the TCF7L2 genotype, which is associated with an increased risk of type 2 diabetes. 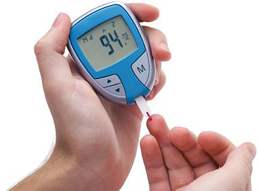 "We are aware of certain high-risk gene variants for type 2 diabetes. However, the causative mechanisms on the path to this disease are still largely unknown. With our results, we are helping to close the gap between disease-associated genes on the one hand and the development of diabetes on the other. A typically changed metabolic performance can supply early indications of diabetes", explain Simone Wahl from HMGU and Cornelia Then from LMU, first authors of the two publications.